'The League of Literacy' is a 44-page PDF eBook (and three short, scene-setting video clips) offering a unique look at the 'nuts and bolts' of literacy (grammar, punctuation, spelling). Here in the UK, we've seen an emphasis in recent years of government policy encouraging us to look at these nuts and bolts out of context (things like getting students to read nonsense words in synthetic phonics, an emphasis on the teaching of stand-alone grammar - particularly in preparation for Year 6 SPaG tests and, many would argue, a neglect of "reading for interest"). After our maths resource The M Files proved so popular, we've always had half an eye on producing something similar for English. And so here it is. At Sparky Teaching, we like doing things differently and this resource is no exception. We've imagined that The League of Literacy has one goal in mind - to keep our streets free of crimes against the English language. It encourages your students to look for evidence of "crimes" themselves and to care about the rules that our language has. It's our attempt to make something interesting out of something that perhaps isn't always so. To supplement the resource (and add some realism to the concept) we have set up a Twitter feed for the League and (hopefully in time) their own web page too! The League of Literacy costs £10.60 (approx $17). To purchase the resource, click the button below which will send you to a secure PayPal checkout. Once payment for the £10.60 has been accepted, click the link that tells to go back to Sparky Teaching (this bit's important!). You will be redirected to a page where you will be able to download the resource. We will also send you an e-mail containing a link to the download page. Remember to keep a copy of your receipt if you intend claiming the cost of your purchase from your school budget. 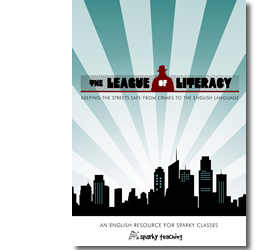 If you're a sparky-minded school and you want to buy a few resources at once, you might be better off getting The Outstanding Teaching Pack which includes The League of Literacy (and the rest of our downloads) and is a ridiculously good offer! We can invoice your school directly. The League of Literacy is an electronic resource. If you're a publisher and might be interested in seeing it in print, do get in touch. The League of Literacy is copyright Sparky Teaching 2013.